440 pages | 10 B/W Illus. From pre-European contact to the present day, people living in what is now the United States have constantly manipulated their environment. The use of natural resources – animals, plants, minerals, water, and land – has produced both prosperity and destruction, reshaping the land and human responses to it. The Environment in American History is a clear and comprehensive account that vividly shows students how the environment played a defining role in the development of American society. Each chapter includes a selection of primary documents, and the book is supported by a robust companion website that provides further resources for students and instructors. Drawing on current scholarship, Jeff Crane has created a vibrant and engaging survey that is a key resource for all students of American environmental history. "In clear, elegant prose, Jeff Crane provides a fresh portrait of an America in the throes of environmental change. As environmental issues confront citizens at every turn, thoughtful reflections such as Crane’s will become ever more important to the security of the nation’s future. Highly recommended." "Clearly written and intuitively organized, The Environment in American History offers a balanced and accessible way for students or anyone interested in American history to appreciate the role of nature in the ongoing development of the United States." "Jeff Crane tells compelling and emblematic stories that firmly ground four hundred years of American history in environmental context. Like few surveys available, this book effectively incorporates recent history as well. Crane’s creative choices for the document section will be useful in the classroom, foregrounding the sources and methods that make it an excellent book." "Jeff Crane delves deeply into a wide breadth of topics vital to understanding U.S. environmental history. The Environment in American History promises to become a leading textbook, especially for instructors who aim to give students a more in-depth view of the ways in which nature has under-girded American history and a better understanding of current environmental problems." 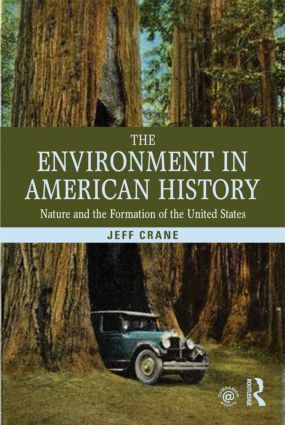 "Crane offers a comprehensive overview of American environmental history that goes way beyond formation, and right up to the present day. The book is clearly targeted at the undergraduate market, and thus includes a wide range of illustrations, primary documents and seminar questions … Crane thus provides a conventional take (and textbook) on an unconventional topic, competently assembled and with much merit, and a sound introduction." Jeff Crane is Associate Dean of the College of Humanities, Arts, and Social Sciences at the University of the Incarnate Word in San Antonio, Texas. He is the author of Finding the River: An Environmental History of the Elwha, and co-editor of Natural Protest: Essays on the History of American Environmentalism.